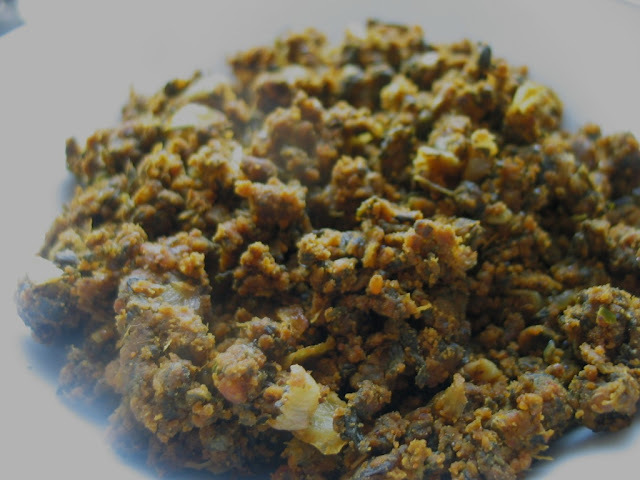 Nisha's Kitchen: Kale Junka / Kale cooked with chickpea flour and mild spices. Kale Junka / Kale cooked with chickpea flour and mild spices. Kale is something that my family don't like yet so i keep trying new recipes . Just yesterday i had some of it lying in the fridge and thought of cooking it in Maharastrian style with besan and everyone seems to have liked it because they ate without any complaints. If you ask me i myself don't like besan much :) .But since everybody else liked it i thought of recording the recipe .So here is my version of junka. 1. Cook kale with salt ,green chilli and turmeric till tender. 2. Heat oil and add cumin seeds. Let it crackle. 3. Add onion , ginger garlic paste and cook . 4. When onion turns translucent add besan and keep stirring. 5. Cook besan till the raw smell vanishes. 6. Add chilli pw and add amchur and mix well. 7. Add kale and cook mixing now and then till mixture turns to crumble. 8. Serve with dal ,achar and roti. Kale is a green available here , kashmiri's cook with it in India i think. Hi Nisha , Can You please tell me also what is Kale and how does it looks like? HI Nisha..Wow..this is creative..We use kale in soups..
the dish looks very nice but can u tell me what is kale?? kale -chickpea flour combination looks delicious..sure will try this version. I tried this once from some other blog. I didn't like it much. I will definitely give your version a try. I liked the ingredients you have used. great idea to use greens, must try this, we quite like jhunka at home! Nisha,,kale fry looks delicious with chick pea flour dear...i hv nt tried kale in stir fry version sounds great dear,,sure will try out this,,Nisha. Thanks for stopping by in my blog dear,, thanks for informing the followers option. How to do to get link of my blog in others dear...i dont know how to do?..can u assist me?.. Nisha,,thanks for ur answer dear..i tried to click "follow " option in my blog it showed the screen with sign in with "google" "yahoo" "twitter" dear,,it didnt showed the "more option".